Posted: Sat 15 Oct, 2005 3:39 pm Post subject: Shields - What do you prefer? Do you have a favourite? 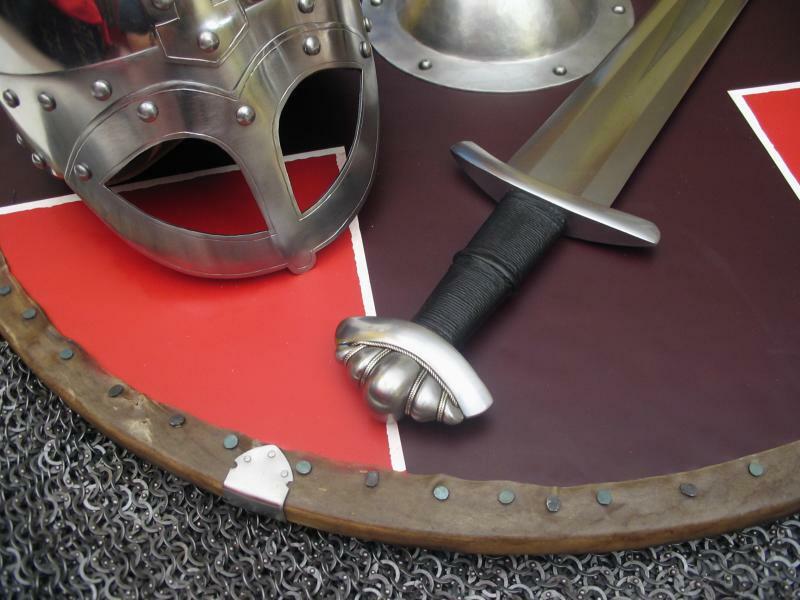 The shield was, for so much of the Ancient and early to high Middle Ages, an essential item of war gear, and the form, function and decoration of a shield can tell a good deal about the culture that produced it. Despite that, the importance of (and effectiveness of) shields seems to be largely overlooked in modern film, media and print. I think it is a shame. For me, the 11th to 12th century teardrop (aka Norman / Kite / Almond shaped) shield is the one. My interest in the period plays a large part, but I also think it is close to an ideal blend of form and function, ideal for both the heavy horseman and heavy footman. 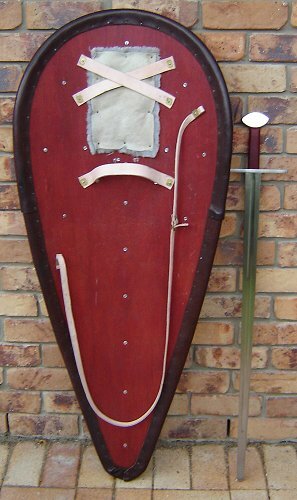 Enclosed are pictures of a late 11th/ early 12th century Italo-Norman teardrop, with the slightly unusual feature of steel reenforcement straps riveted to the front (an interpretation based on several items of iconography). I made the shield blank and another chap finished it. It is a solid and quite heavy piece of gear, but I am sure it would prove it's worth in the front line of a battle. So, what shield forms do you have an interest in? What do you prefer? What would you want to take into battle? Anyone else have pictures of any of their shields? Showing a period enarme arrangement. I'm a heater shield type of guy myself. I don't have any pictures handy of mine, but it is the MRL large heater shield, painted argent with a saltire cross sable nine lozenges argent. I put grey felt on the back for comfort. The large kite shields really appeal to me and I really like the metal bands on the face of yours specifically and in principle: A little well distributed metal should go a long way increasing the service life of a shield before it needs major repair or replacement. I also like the later flat topped versions with or without a non-functional decorative shield boss: Non-functional in the sense that it doesn't serve to protect a hand grip but might still function when punching with the shield. The heater shield appeal less to me because I like the Kite shield better: Period compatibility issues mean that the large Kite shields don't belong with later transitional or plate armour. As a left hander the round shield can be used by either hand without hand grip position issues. The later 15th / 16th century all steel round shield would be my favourite from a practical perspective any period compatibility issues aside. Of the several shield types I've been able to wield with a weapon, whether it was in mock combat with wooden swords or just swinging a real sword of spear by myself with it, I'd have to say I prefer a pelta. 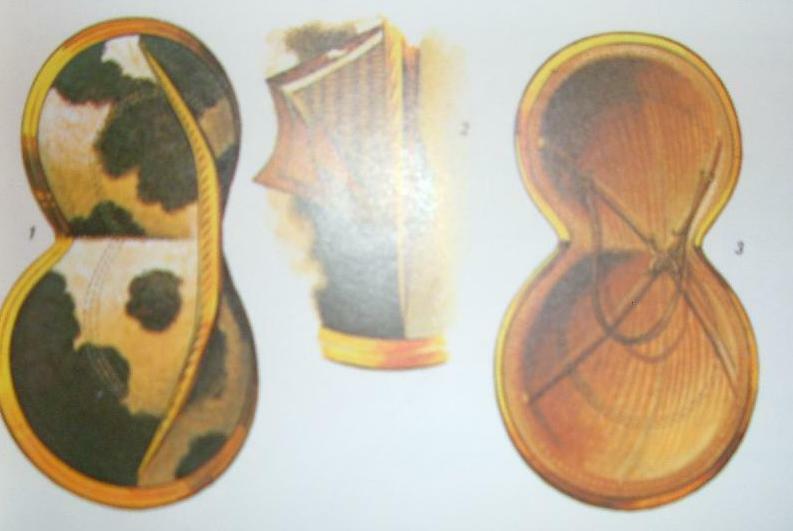 More specifically, the "inverted-pelta" shaped shields believed to be used by Late Mycenaeans, which have the cut-out of the circular base at the bottom, rather than the top. I'm currently reconstructing one from planks, although there is no evidence to say whether they were made from wicker or planks, one way or the other... The planks are actually Oak plywood, although I took care to make sure this wasn' t really noticeable by cutting the wood up, and then flipping different pieces over and trading their places to make the planks look random, and also by extending the hide around the edges to hide the construction. It has a cowhide cover glued to the front with tabs pulled over to the backside and glued/stitched down in place. The diameter from one side to the other is 22.5", so the shield is light, even with 1/2 inch thick planks. The rim will be about an inch wide, and be flat over the front of the shield, using the Kaloriziki find as supporting evidence. The shield will have a hoplite-style grip with the forearm holder and the grip, based on a plate in "The Mycenaeans 1650-1100 BC" by Nicolas Grguric. The picture, which is part of a surviving fresco from Pylos, shows a warrior with a small, circular shield with an aspis style grip. I do not know if part of the picture was reconstructed for his arguments sake, but until I can find evidence to disprove the image, I'll rely on it. I've never seen the picture published anywhere else. It will also have a guige strap, or telamon, attached to it. It will be made from multiple layers of black wool, stitched down the folded side. The strap will be in two pieces, and simply be tied in the front of the body when it's being carried, to allow the user to adjust it appropriately. 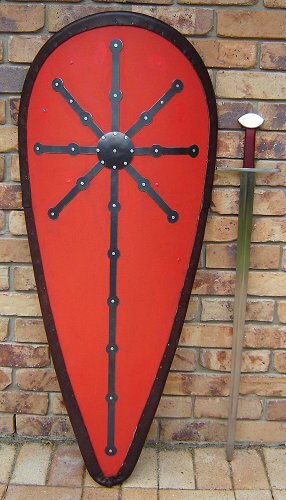 I find this style of shield to be the ultimate mix of mobility for myself! I'm a runner, and often find myself jumping about in combat with my friends. The inverted pelta shape allows the shield to be held against the body, but does not impede the movement of the legs at the same time. The telamon allows it to be worn as back protection when not in use, and also to be kept out of the way. The bosses, although no holes will be present, serve as added protection in the area the arm extends over on the shield's backside. The grip allows the light shield to be even more well distributed during combat, and held with a greater firmness. The kite obviously gives a lot of protection, but the heater (all other things being equal) is a bit more maneuverable. I only have a cheap MRL heater at the moment, but I've tried the kite style before and it definitely gives a real sense of security. For me it's a tie between the two (though, on looks alone, I'd go with the kite). Long time, no chat! I'm in envy of your kit, and your shield looks awesome! I've personally quit my Dark Age stuff and sold off what little I had, and am focusing on my Bronze Age and 14th century. But my favorite shield will probably remain the small Mycenaean one. 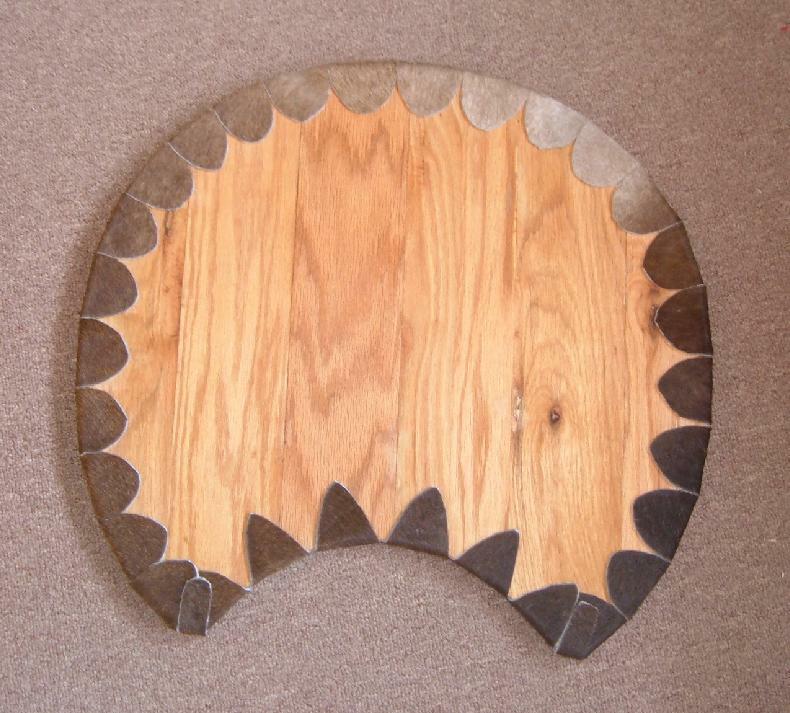 My ultimate goal in the next couple of years is to make a Figure-of-Eight shield, as shown below. I've seen them reconstructed, and even used on documentaries about the late Bronze Age Achaeans, but no one has ever made one from reed wickerwork with nearly enough curvature. I hope to be one of the first (if not the first!) 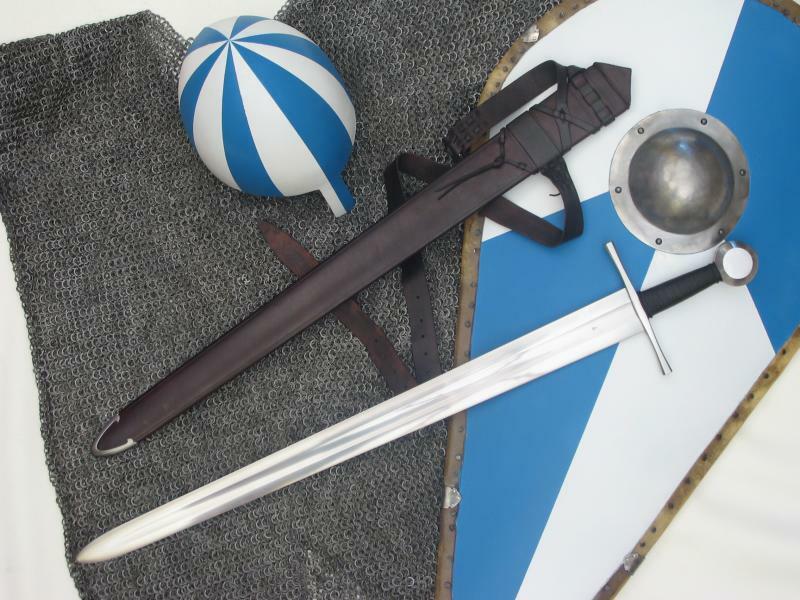 THAT will give some good protection while allowing a spear to be used quite freely with two hands via the use of a properly suspended telamon. I'm glad you've decided to focus on the Bronze age stuff. We don't have very many people focusing on that period and it deserves more coverage. My personal favorites are the somewhat controversial convex shields depicted in Anglo-Saxon and Carolingian illustrations... there don't seem to be too many people attempting these today but there are a few. Tim Noyes makes some nice grips, and offers convex shield blanks made from pressed plywood. I'm hoping to have a go at making one myself this winter, but we'll see how things go. Don't have much experience with larger ones but I do like the kite shields. I'm currently training with A&A's English Buckler and it's very effective with side sword work. Your kit, also, Patrick? I like the spectacle helm. And the Jarl. And the shield, for that matter. Bulckers for fun, kite for utility. The main disadvantage of the Kite is that it's do darned effective that it makes dueling boring and unrealistic. The buckler, however, is a lot more fun to use because it requires speed and skill. How does the shield's effectiveness make it's use unrealistic? Yes it is, and thanks. The helm and shield were featured in our last update. This was one of the photos I took for Christian Fletcher's last photo contest. Since shield style and use is rather period- and style-dependant, sometimes this is chosen for you. Now, I know that has nothing to do with shields, but the effectiveness of the armour combined with the refined schools of swordsmanship made up for it's absence.